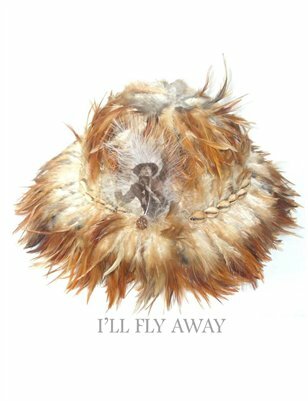 I’ll Fly Away is an artistic tribute to Sunday’s in the Black Church by artist, Ann ‘Sole Sister’ Johnson. I’ll Fly Away is a hymnal that is often heard on Sunday mornings. For this exhibition I created a collection of hats and fans that honor Sunday’s in the traditional Black Church. Metaphorically, using the intaglio process, Johnson printed images on feathers that include: members of her family, church choirs, a bewildered young slave girl, and a reoccurring image of woman who is “touched” by the Holy Spirit. The exhibition originated in Houston, Texas at Hooks-Epstein Gallery.